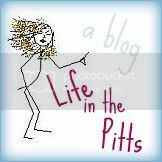 Life in the Pitts: Another near miss. Just got home from the ER. I was carrying Leo down the stairs on my hip, and my foot just slipped out from under me. I hit hard, and he flew out of my hands, slammed face first into the wall around waist high on the landing, hit the ground, and then bounced down the bottom 4 stairs. I can't even tell you, guys. My hand wasn't working, but I managed to pick him up. He didn't black out, cried for maybe 2 minutes, and then was perfectly fine and wanted to crawl around. I was on the phone with his pediatritian's office within a minute, asking what I should look for for a concussion, but they said that I had to take him to the ER. This little, you don't want to wait for symptoms of a concussion. I explained that I am watching a friend's 2 year old while her newborn is at the ER right now with a fever, and I had Syndil, and not enough carseats. He said "Ma'am, I would never suggest this. And I don't want to scare you. But this one time, put one of the toddlers in the car in the adult seatbelt, and drive carefully. It is that serious." So...I didn't do that. But it put it into perspective. A friend rushed over to watch the girls, and I took Leo to the ER. Anyway, he is fine. But the image of him hitting the wall, falling, and bouncing down the stairs will not leave my head. The what-ifs are haunting me.